Order within the next... 0 hours, 19 minutes, 20 seconds ...for dispatch today! Presnted on a 16 inch Spanish board. A striking and dramatic set with two very distinct sides. 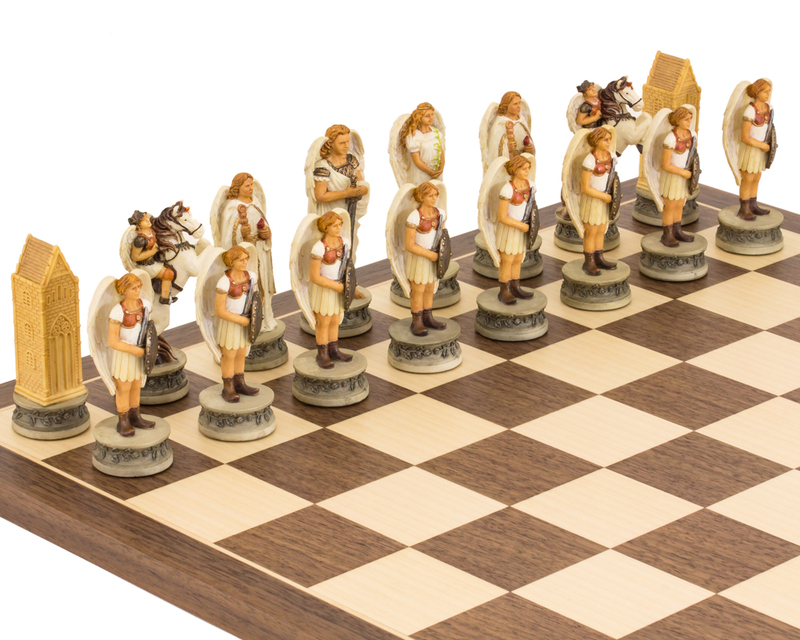 As with all these hand painted sets from Italfama, the detail is superb bringing your chess board and game to life. 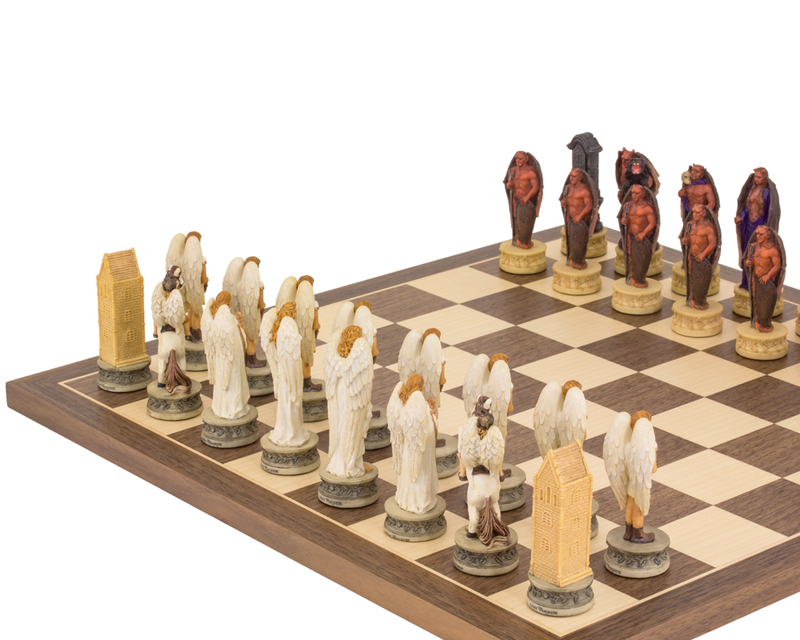 Despite their golden locks, white robes and large wings, this army of Angels is still a force to be reckoned with. Surprisingly, the king bears a very large sword whilst his beautiful and demure Queen carries flowers. A heavily robed Bishops walks with a staff and book in hand whilst a magnificent white unicorn with angelic rider stands as their knight. 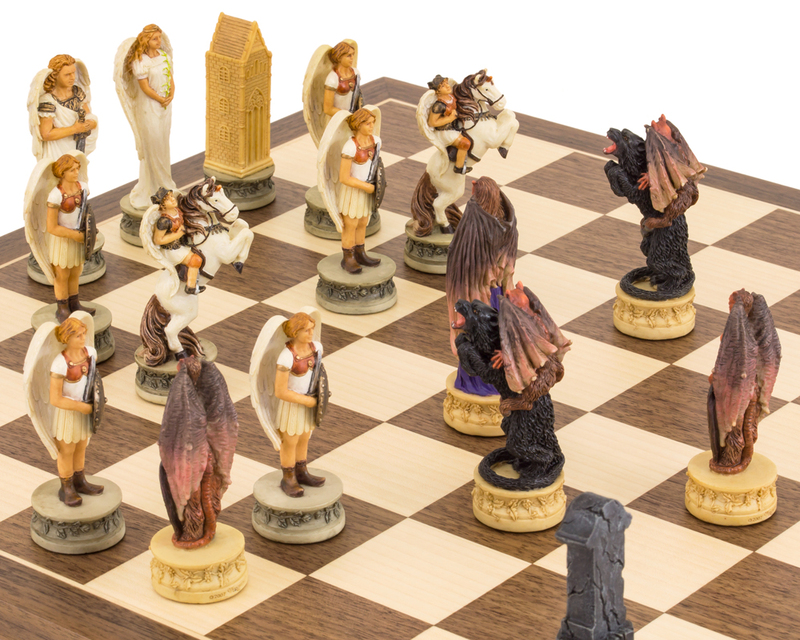 The pawns have a Roman soldier air about them so despite their wings, they are armed with sword and shield ready to take on Evil. The rook is portrayed by a church-like building with its large arched windows and door offering sanctuary. With a reddish burnt look to their skin and soiled wings, the Devils are dark in colour and an exact opposite to their counterparts. A fierce-some beast complete with cloven hooves and horns stands as King. His muscly physique and demonic gaze sufficient to render his foe helpless with fear. 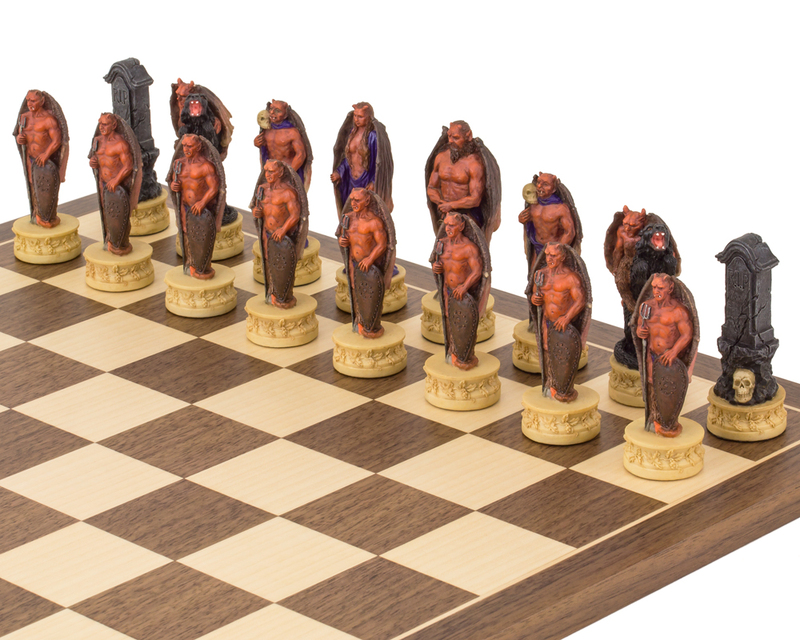 Whilst still an intimidating figure, his queen is probably the least grisly out of this army. With his cloven hooves, horns and fangs whilst brandishing a skull capped staff, the Devil’s bishop, however, has to be the most formidable looking bishop we have seen in this Italfama series A ferocious knight is in the form of a growling, grisly werewolf creature with a rider brandishing his pronged fork. Made from black stone, cracked with age with the simple inscription of RIP and skull peering from beneath, the rook in this set, is a typical horror movie headstone. 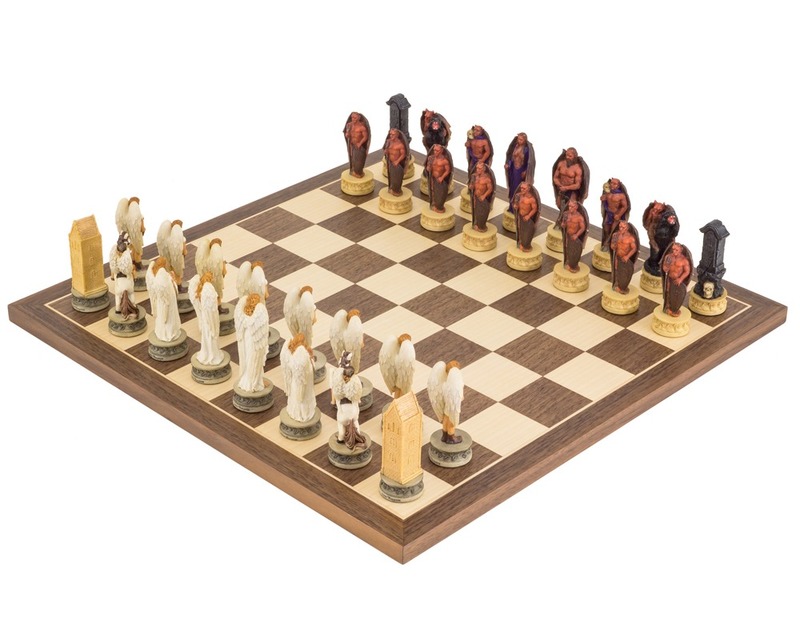 To complete this ghoulish army are the pawns, just as foreboding as their king, armed with pronged forms and shields. 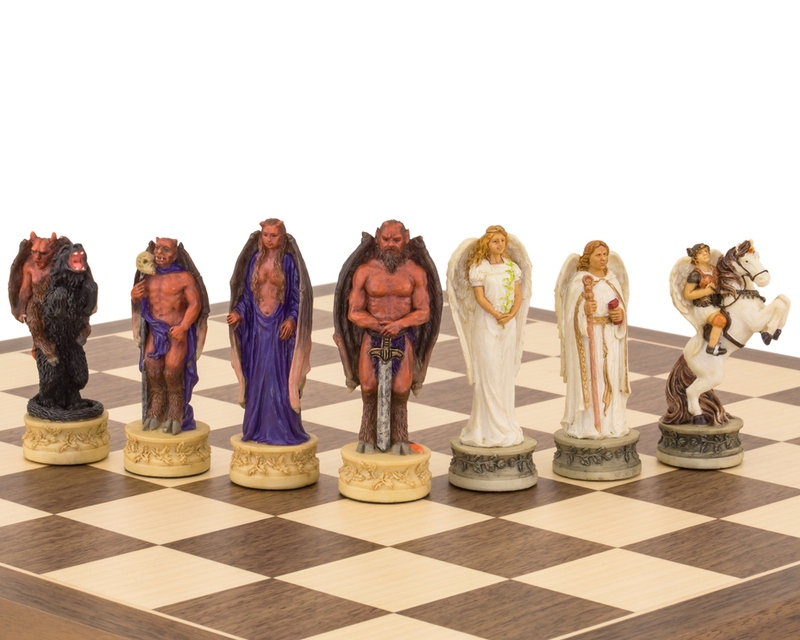 The Angels vs Devils Chess Men are also available without a board. Either way, they will make a superb gift. Angels are spiritual and very powerful beings created by God to serve Him, as his messengers. The Bible quotes numerous occasions when they appeared to mortals saying “I have come as a messenger from the Lord” and the New Testament declares they are also ‘ministering’ beings sent to care for and watch over humans who are considered to be heirs of salvation (Hebrews 1:14). The idea of Guardian angels originates from a declaration from Jesus Himself “for He said their angels always behold the face of God (Matthew 18:10) indicating that children have angels who are assigned to them. In addition to these ‘worker’ angels, there were also Archangels (Angel Princes) such as Michael who allegedly represented an entire nation. Whilst the Bible does mention some angelic features, we do not know for definite what angels look like. The first chapter in the book of Ezekiel, it tells of a vision in which a group of angels so holy appeared as flames. Although they seemed to be like men, they had four wings and multiple faces. Seraphims have six wings and cherubim covered the Holiness of God himself. Whilst Angels are magnificent creatures, they are also very powerful, unlike the angelic and childlike portrayals in Renaissance art. They have a power so immense that one angel alone destroyed 185000 soldiers in one night (II Kings 19:35) and allegedly their presence is so overwhelming that those who see them have been known to fall, unconscious to the ground. When Satan, who was the very highest angel, turned against God, became a fallen angel or devil and he took a large number of the angels with him in rebellion. They were cast out of heaven when their insurgence failed and those rebellious angels are now devils. In the same way that angels reach the very heights of spirituality, demons too can reach down into great depths of bitterness, hatred and perversion. 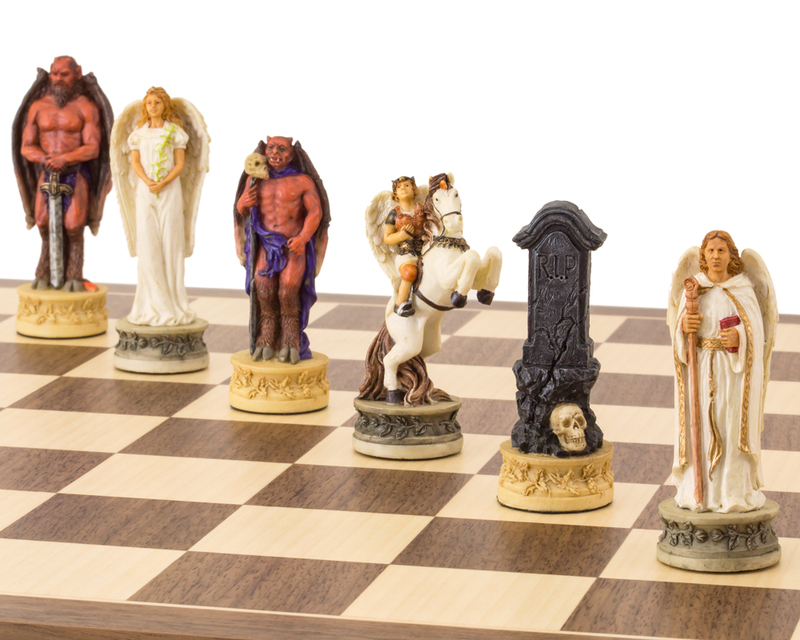 The devils have what are known as "principalities and powers”, similar to the angels with their archangels and higher powers, but whatever their position, devils are only interested in tormenting and possessing people to turn them away from God.